SPECIAL v2 LAUNCH PRICE FOR A LIMITED TIME ONLY – GET IT NOW! We are now helping more than 100 000 people to wake up rested! 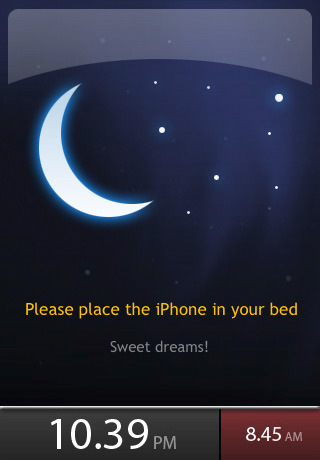  Sleep Cycle monitors your movement during sleep using the extremely sensitive accelerometer in your iPhone.  Sleep Cycle then finds the optimal time to wake you up during a 30 minute window that ends at your set alarm time.  Look at the screenshots for recommended iPhone placement. Sleep Cycle also saves your sleep data and displays a detailed sleep graph and sleep statistics for every night you use it. Remember! Do NOT lock your phone when going to bed. Sleep Cycle automatically shuts down your screen and puts the phone into a power saving mode. If you lock your phone Sleep Cycle will not sense your movement and will then only be able to wake you at the end of the alarm time. Update: we are very happy to announce that full time work on the next major Sleep Cycle version is in progress! Article suivantapplication ooTunes Radio – Recording and Alarm Clock !